Victoria Atkins speaks to delegates at the event in London today. The event in London today (Wednesday 27 March), co-hosted with the Ethical Trading Initiative and the Organisation for Security and Cooperation in Europe, aimed at driving change in the public sector of addressing issues of modern slavery. As part of the conference, the Home Office launched a free Modern Slavery Assessment Tool, which will be available across the UK’s public sector. Developed in partnership with Ethical Trading Initiative and the technology firm NQC, it will help public sector organisations identify and address modern slavery risks in their supply chains. The tool will provide organisations with a tailored report, based on an online questionnaire, indicating the risks of modern slavery being present in their supply chains, and providing recommendations to reduce those risks. A new online training course on ethical procurement, developed with the Chartered Institute of Procurement & Supply (CIPS), was also launched. The course will be available to all CIPS members for free, and at a discounted rate for all civil service commercial staff. The Cabinet Office will also shortly publish new guidance on tackling modern slavery in supply chains for commercial staff across the public sector. 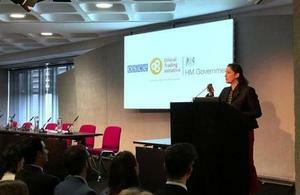 In her speech, Minister for Crime, Safeguarding and Vulnerability, Victoria Atkins, highlighted the need for the UK and its international partners to harness their spending power to drive change. In the UK alone, central government spends £47 billion and the wider public-sector spends £220 billion a year. It has been estimated that there are 25 million people in forced labour globally. "We all know that modern slavery, forced labour and human trafficking are not evils of the past. They are with us today and their victims are hidden in plain sight. "We are doing more to leverage UK government procurement spend and take responsibility for the conditions in our supply chains, but we need the global public and private sector to do the same if we are to succeed. The best way we can do this is to work together so we can make more of an impact." "The government is determined to tackle modern slavery throughout society, so it is only right that we work with our suppliers to address any traces there may be within our own supply chains. This is a moral imperative. We must remember that people are at the heart of this work and just one victim is one too many. "That is why we will be asking our suppliers to act quickly and responsibly in identifying and tackling instances of modern slavery throughout supply chains and we’re letting them know that they have our backing in tackling this serious issue." More than 150 delegates, policy makers, procurement officials, leading UK businesses, civil society experts and key international institutions attended to share best practice and discuss common barriers to addressing modern slavery in public sector supply chains. "Governments have huge power and leverage. They need to show political leadership and commitment and push public sector suppliers to conduct robust human rights due diligence. "In-house expertise and appropriate procurement policies and practices are an absolute necessity." Since the Modern Slavery Act became law in 2015 private companies of a certain size have been required to produce a statement setting out what they are doing to identify and address modern slavery in their supply chains. The Prime Minister announced at the G20 summit that the government would be producing its own transparency statement, setting out the actions being taken across central government to address these risks. The UK government also last year launched the Principles to Combat Human Trafficking in Supply Chains at the UN General Assembly in partnership with the United States, Canada, Australia and New Zealand.